A+ v3: The A+ certification has been long recognized as the industry standard for anyone interested in establishing a career in IT. The certification prepares individuals to take on both technical support and IT operational roles. This new lab library includes 15 labs that map to CompTIA® A+ exam objectives. Learners will develop an understanding of a broad range of topics including networking, operating systems, security and mobile devices. 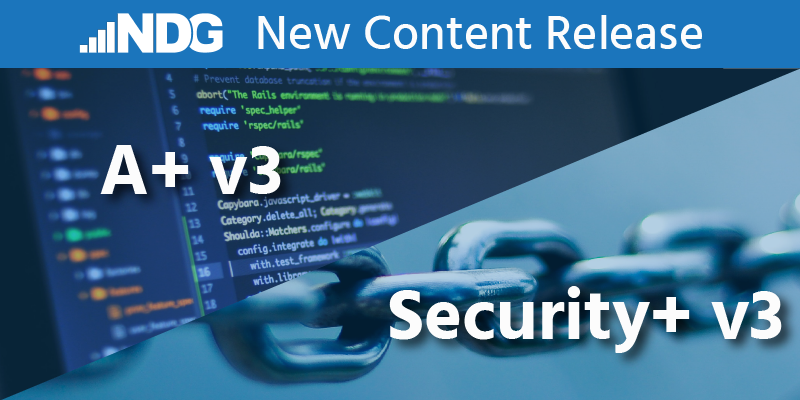 Security+ v3 (beta release): Security+ is a vendor-neutral certification that proves competency in network security and risk management. Security+ labs focus on the principles and best practices in network security. This new lab library includes 25 lab exercises designed to align to the content of your choice. Learners gain hands-on practice in the skills needed to secure a network and prepare for industry certification. See the links above for information on compatible topologies and class settings. This new content is available to all NETLAB+ customers with a current maintenance agreement.